New Moon, Half Moon, Shiva's Smile...what does it all mean?! Monday of this week was the beginning phase of a moon cycle. On the new moon the Chicago skies were so bleak with clouds so we weren’t missing much anyway. But, if you are following the Farmer’s Almanac or are a night sky enthusiast you may have already known there was no moon to see Monday night. The observable nature of the passing of time is evident in the moon’s phases. With new moons there is the symbol of regeneration and rebirth. There is a beginning, and ending and a starting over again. It’s interesting to note that Hindu cosmology follows this same pattern. For class I chose to focus on Ardha Chandrasana but from the perspective offered to me by my teacher many years ago. 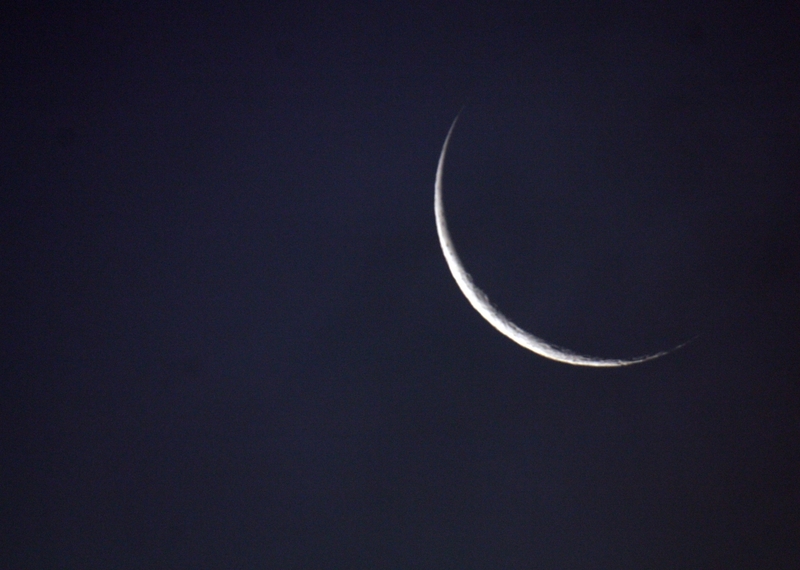 When the moon is a brand new crescent and hangs horizontal in the sky (looks like a thin Cheshire cat) it is the actual half moon the posture is referring to, not a half-pie shaped moon. This moon is considered the smile of Lord Shiva. Shiva represents cosmic time where things can take thousands of years to pass. Conversely, the moon is more micro level where we as humans can perceive time passing. However, Shiva and the moon are inseparable. One story is that when the ocean of milk was being churned by the angels and demons to find the amrita, or nectar of immortality, many unforeseen things arose to the surface. Lovely offerings such as the wish-fulfilling cow and Sri Lakshmi bubbled up as well as a poisonous gas, the hallahalla. Lord Shiva took the poisonous gas into his throat to protect everyone. This poison burned his throat turning it blue so when the crescent moon sprang forth from the churning it decided to sit in Shiva’s dreadlocks to offer it’s cooling energy. Shiva’s smile while in meditation or performing his ecstatic dance of bliss is just barely a smile. A hint of a smile, really. It is thought to look like a crescent moon. The new moon is an ancient symbol for marking the passing of time and in Indian mythology everything is cyclical. When a cycle ends it is reabsorbed just like a waning moon returns to dark sky only to emerge as a thin sliver again. We used moon postures like Ardha Chandrasana and crescent shapes to represent the cyclical nature of time and our ability to regenerate ideas and see tangible phases within postures.